FREE PICK UP AND DELIVERY! WE MEET OR BEAT ALL COMPETITORS PRICING! OUR DEALS WILL BLOW YOUR MIND - NOT YOUR WALLET! Honest and Dependable Service, Fair Prices, Highly Recommend. Our repair facility was established in 1987 by two friends, Rich Conte and Sal Casano. We started our facility on a shoe string and a dream. 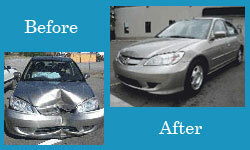 Our goal was to produce the best collision repairs possible at a reasonable price and to make our customers or friends for life. 2014 © Collision Specialists of Inwood. All Rights Reserved.